Her remark made me laugh yet caused a moment of reflection. There are a lot of things we say we need. But how many of us are just saturated with want? The women slowly began chattering about the things they couldn’t live without. Food, water, clothes. Preferably a roof over head. That was it. When we’re too busy to attend church because we’re gone every weekend doing sports or getting our much need R & R at the lake, we’ve bowed down to the idol of entertainment. When we give away precious time with our children because we’re working late to afford that sleek new vehicle that we just had to have, we’ve fallen at the feet of the idol Possessions. When we sacrifice our sleep because we’re too busy scrolling through social media, updating our pictures or checking to see how many follows or likes we’ve gained, we’ve worshiped the god of self. Am I saying it’s wrong to take a vacation or crave some down time? Absolutely not. Our bodies have emotional and physical needs as well. The problem comes from an out-of-balance life that focuses most of its attention on physical desires and entertainment and starves out the spiritual man. An out-of-balance life has a nasty way of tipping over at some point. 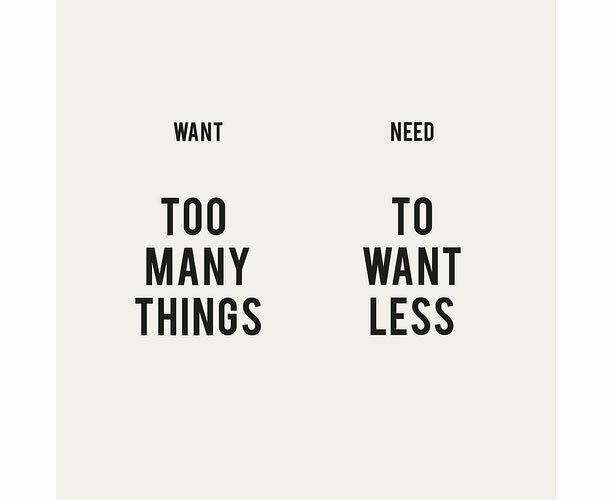 Quite honestly, sometimes we are so focused on what we want, we end up missing the things we need. But here’s the amazing thing: when we focus on attending to our spiritual needs, a vibrant, obedient relationship with Christ, the other needs, the emotional and physical things tend to be filled as well. He takes care of all of it. Forget the techie gear or our ever-expanding wish lists. What we actually need is a heart focused on Christ. We need to not just make him number one but our everything. We need a heart surrendered to obey Him, even if that hard thing He’s asking us to do isn’t on our wish list. We need to nurture our time with Him. Food, water and shelter are good too.